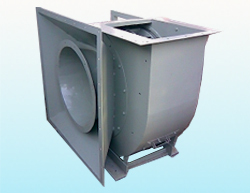 OEM and industrial process fans and centrifugal ventilators; high temperature oven centrifugal fans, high pressure blowers, as well as replacement fan / blower / ventilator centrifugal wheels and blades. Roof and wall exhausters, ventilating and air-conditioning equipment, pressure blower HVAC, heating ventilation and air conditioning, industrial process and OEM blowers. Designed and built with higher pressure fan wheels than axial flow fans. 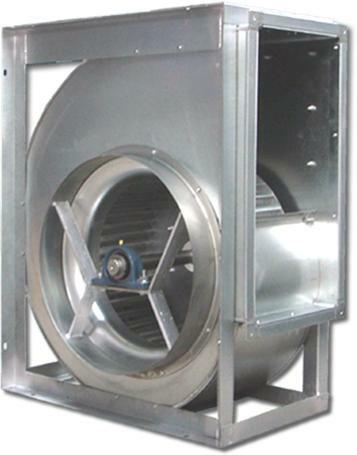 Centrifugal fans operate at elevated pressures but with lesser air volume compared to axial flow fans. There are three basic fan wheels: the forward curved, backward curved, and the radial blower wheel make up the family of the centrifugal flow fans. Forward curved centrifugal fans - centrifugal fans with blades pointing in the direction of the fan rotation. Due to the large volume and high pressure delivery of forward curved fans, these fans are very compact and operate at low speed that ensures quiet fan operation. Typical applications are: heating and air-conditioning, ventilation, and other HVAC systems requiring quiet operation with large volume of air to be moved at high pressures. Backwardly curved centrifugal fans - centrifugal flow fans with blades inclining backward from the direction of wheel rotation. This type of fan wheel have to be operated at higher speed in order to achieve the same volume and pressure as the forward curved fans of the same size. The main advantage of the backwardly curve fan is its non-overloading performance curve characteristics. Radial blade fans - with the same wheel diameter size as the forward and backwardly inclined fans, the radial fans develop the least volume. Pressure is higher than the backward curved but lower than the forward curved fans. This type of fan find wide use in high pressure and high temperature industrial process applications. Stock of tubeaxial & vaneaxial inline duct fans, blower and fan repair / balancing, replacement centrifugal and axial fan blades, axial duct fans, aluminum pressure blowers, FRP ventilators, dust collectors blowers fans, dust collection fan ventilators, high temperature oven circulation fans, explosion proof ventilatoprs, spark reistant fans and blowers, induce & force draft fans, fan blower impellers. Axial swingout fans are designed for frequent cleaning and provide easy access to the fan’s internal components without having to remove it from the ventilation ductwork. These Canada Blower fans have a proven track record for handling rugged exhaust applications in a wide variety of environments. Full Swingout Fans: Impeller shaft and bearings are mounted to the door providing easy access to all components outside of the airstream. 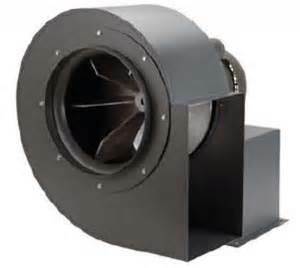 Canada Blower swingout fan construction is for vertical mounting applications only. Single & Double Door Clamshell Designs Large hinged access doors provide easy access to the fan components. Impeller shaft and bearings are mounted to the housing and stay in the airstream when the doors are opened. One of the two access doors is wide enough for impeller removal. Canada Blower clamshell construction is for vertical mounting fan applications only ventilating.com fanblower.com highpressureblower.net industrialblowerfan.com industrialfanblower.net industrialfanblower.com pressureblower.net northernindustrialsupplycompany.com industrialpressureblower.com tenderall.com chicagoblowercanada.com cbblower.com buffaloblower.com buffalofan.com nis-co.com canadianblower.com olegsystems.com canadablower.com abbblower.com acmefan.net industrialblower.net fansandblowers.net americanblower.net barryfan.com cincinnatifan.net canadafans.com barryfan.net pennbarry.net pennfan.net tcffan.com. Full Access Doors: An oversized, full access fan door is used for applications that require occasional access. After the full access door is removed, the internal components of the fan can be accessed through a bolted inspection port on the interior of the fan. Quick Open and Bolted Access doors allow for easy fan inspection. The Quick Open Access Door is specifically designed for fan’s that require frequent inspection.